Give A Quilter An Inch - She’ll Think She’s A Ruler. 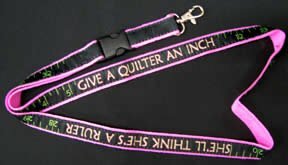 New spin on an old favorite, this scissors leash with attitude helps you keep track of your small scissors in the sewing room, car, or classroom. Black with lime & fuchsia imprint. Detachable end.